In Harold & Kumar Go to White Castle, Harold Lee (John Cho) works as a lackey in an investment banking firm, where his elitist white bosses dump their statistical assignments on him because he’s Korean-American and automatically good at that stuff. Kumar Patel (Kal Penn) is an Indian-American med student who doesn’t want to follow in his father and brother’s footsteps and become a doctor. What better way to divert themselves from their troubles than to smoke pot? 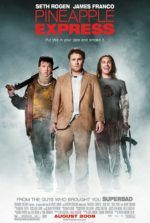 While getting stoned, they catch an advertisement for the title’s fast-food establishment. Our heroes set out with only a foggy idea as to their destination, to find a White Castle somewhere in New Jersey. Why White Castle? Why those square little anti-morsels called Sliders? Even the name, Sliders, is contradictory to the consistency of burgers. Fast-food eaters buy them by the bag full, mow down burger after burger, each gone within one to three big bites. What’s worse, they have a reputation for affecting gastrointestinal digestive systems in the same manner their name suggests. What is appealing about opting yourself into diarrhea? I suppose we all have cravings. I’ve found myself engorging on Taco Bell more than once, only to regret my decision not more than a moment after finishing the last pseudo-Mexican treat. Perhaps it’s a sign of Americans’ obsessive consumerism causing our ever-increasing number of overweight people. Perhaps we just like junk food no matter the physical effects. Then again, stoner cravings know no logic. Given the movie’s premise and title, we might feel bombarded by product placement. One can only guess the degree of support garnered by White Castle to the filmmakers. On the one hand, the franchise would be supporting marijuana usage and a whole spree of illegal activities; on the other hand, the fast-food chain has an entire Hollywood movie dedicated to the idea that White Castle produces fine eats. Since there aren’t Harold and Kumar action figures included with the White Castle equivalent to the Happy Meal (Is there one? ), we can assume the support remains limited to use of the logo, and at least one “restaurant” location. I suppose fast food is a part of life, and to create some phony movie fast-food eatery like Mooby’s would distract even more, even distance the audience’s ability to relate. But by the time our heroes are riding a cheetah through the woods, all sense of reality has diminished in place of almost sketch-like comedic vignettes. One sequence features Harold and Kumar stopping for a hitchhiker, who just-so-happens-to-be Doogie Howser M.D., Neil Patrick Harris. 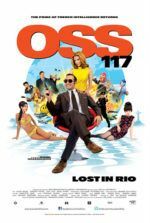 Playing an ironic version of himself, Harris is a womanizing party dude, belching, snorting cocaine from a stripper’s thigh, and searching for hearty doses of loose women (this film was released prior to Harris making a public confirmation of his homosexuality). Another sequence features two licentious “hot babes” with dueling flatulence, confirming what they say: everybody poops. Directed by Danny Leiner, helmer of the unwatchable Dude, Where’s My Car? and several television shows, the film won’t impress from a cinematic standpoint. Indeed, the production is rather underwhelming, though stave your judgments, as many of the cheesy effects are intentionally so. 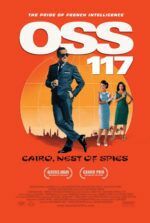 The stupidly clever, nonsensical basis for this movie remains its slight genius. If we questioned every absurd subplot or pointless character, we’d miss the point—that there is none. The standouts are, of course, our two uncommon heroes Harold and Kumar, in particular because of their races. Not your standard whiteboy protagonists, Cho and Penn are refreshingly funny, underlining and indeed mocking contemporary prejudices within our country, while also representing the common man. 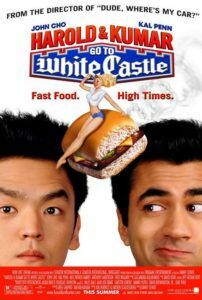 Harold & Kumar Go to White Castle is a curiosity, because while conforming to every tired stoner comedy and road movie genre trope, it embraces an unusual surreality that surprises (and occasionally baffles) us. At once smart and stupid, it’s an odd mix that works just enough to make up for its failures.